Process analytical instruments (PAI) are used for monitoring, modeling, analyzing, and controlling manufacturing processes through timely measurements of critical process parameters with the goal of controlling process safety and optimization while maintaining product quality. These instruments have been used for some time in various manufacturing industries. 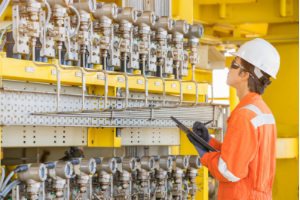 Significant research and development has been done in past decades to decide how to incorporate analytical measurements into manufacturing workflows in order to increase productivity and satisfy regulatory and quality standards. Our latest Report, Global Process Instrumentation 2019 details the use of and market size of these instruments which receive samples automatically and generate results in near real-time. 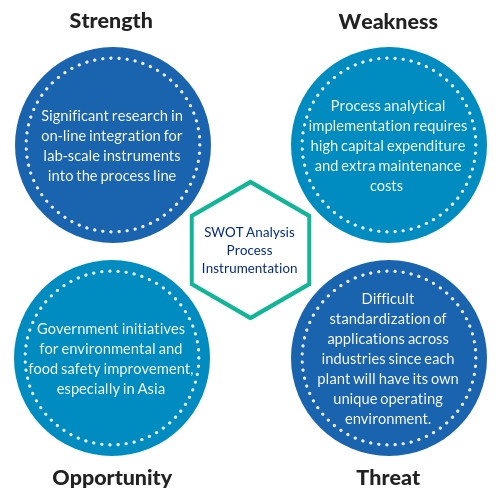 This report provides a market analysis for process analytical instruments. Technical, business, and economic trends are assessed with emphasis being placed on the impact these forces have on demand. All major product types and competitors are identified, and their competitive positions and future prospects are characterized. 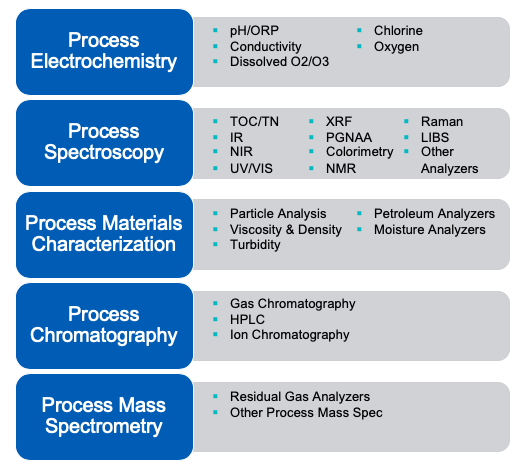 The process analytical instrument market segment is distinct from other so-called process instruments that measure parameters such as power, temperature, pressure, level, and flow. Rather, the categories covered in our report cover more sophisticated measurements, usually involving the quantification or identification of chemical components in a process or waste stream. As an overview, below are the five most important categories of process analytical instrumentation. This article will overview some the applications of these components and how they relate to the PAI industry specifically. Electrochemistry is the branch of physical chemistry that investigates electricity and its relationship with chemical change. Voltage, current, or charge is measured for a given sample, which can be used to determine a unique chemical property, such as concentration. This category of instruments can help quantify the difference in potential across a membrane, determine salt concentrations, or help monitor and control the disinfection of water. Process materials characterization technologies generally involve the real-time measurements of physical parameters such as particle size, stability, viscosity, etc. In the process setting, the most common measurement techniques are particle size & distribution and particle counting. These devices are often used in polymers, chemicals, oil & gas, food & beverages, mining, wastewater treatment, and paper processing. Process chromatography technologies are those which automatically guide a production sample through a stationary phase to separate its components, and then measure the times at which these components elute. Such measurements are used to quickly evaluate the composition of a sample. A mass spectrometer (MS) is an instrument in which a chemical compound is converted from a molecule into ions and the abundance of each ion is measured. This means that they can be used to quantify and identify compounds of interest. MS technology has proven to be an essential process tool in a variety of manufacturing environments and research facilities that require such real-time measurement. As you can see, the primary goal of PAI is to efficiently allow for necessary analysis without disrupting the workflow or process itself. The ability to monitor and adapt processes within real-time mean fewer wasted resources (both in man power as well as key ingredients) while maintaining or improving product quality. Above is a SWOT analysis of this $5.4 Billion market — it’s important to note the impact the changing government initiatives and standard are paving opportunities for growth. Our report further analyses the impacts of these specific characteristics amongst others. The industry as a whole is predicted to grow at rate of 3.3%/ year over the next five years increasing the market size to just over $6.3 Billion. 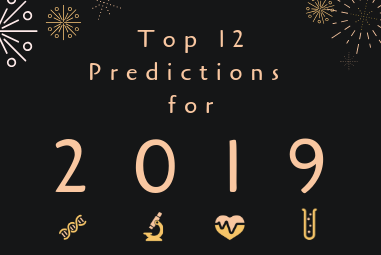 The largest segments are oil & gas, chemicals, and semiconductors and our analysts believe that pharma/bio and the industrial sectors will drive growth. Our report Global Process Instrumentation 2019 helps executives and product managers identify areas of high potential growth, so instrument manufacturers can position themselves now to best benefit from the changes to come. Click here for a brochure containing a detailed table of contents and sample data. If you have any questions on the report’s contents, please visit our product page or download the report brochure here. Want to talk about the details or would like a quick walk-through of the report? Don’t hesitate to contact us at reports@bioinfoinc.com, give us a call at 703-778-3080 x19, or simply click here to schedule a 30-minute call with our market experts.